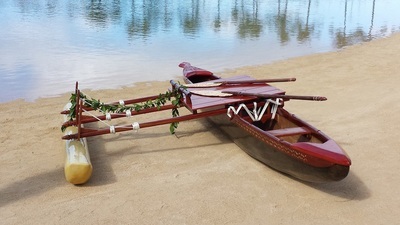 Outrigger Canoe For Sale - Hawaii Woodcarving by Tevita Kunato. This was a commissioned wa`a. I was asked to design and build a `Ceremonial Canoe' to be used for wedding photo shoots. 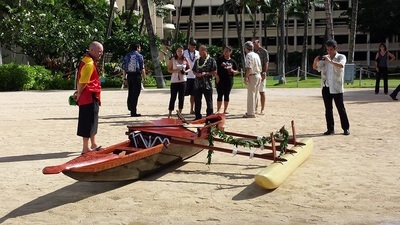 The canoe is in use at Duke's Lagoon, Hilton Village, Waikiki. Because it in service almost every day of the year, I glassed the hull and added 3 layers of carbon fiber to the bottom. The lashings are durable nylon. The ama is glassed foam. 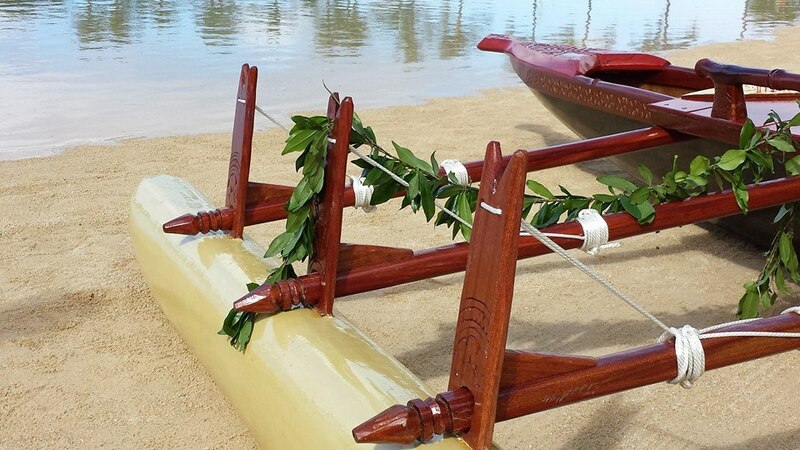 Wedding tapa cloth designs from Papua New Guinea, Fiji, Samoa, Tonga and Hawai`i are carved into the wood trim. Each pattern carries a special meaning related to marriage. The design of the canoe is not specific to any group in the Pacific. I used elements from all over Oceania to create something fun and new. 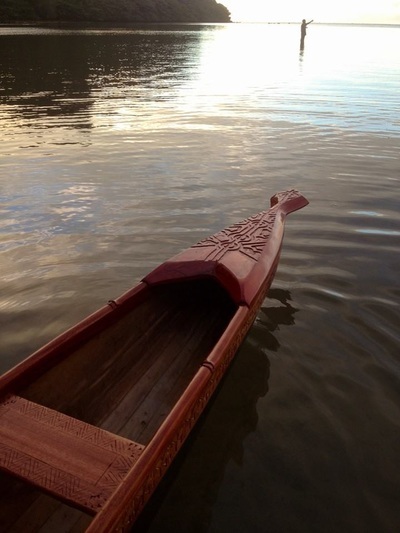 This beautiful canoe model is for sale at One Gallery, Downtown Hilo. Antiqued feel, I wanted to recreate a wa`a as they were. 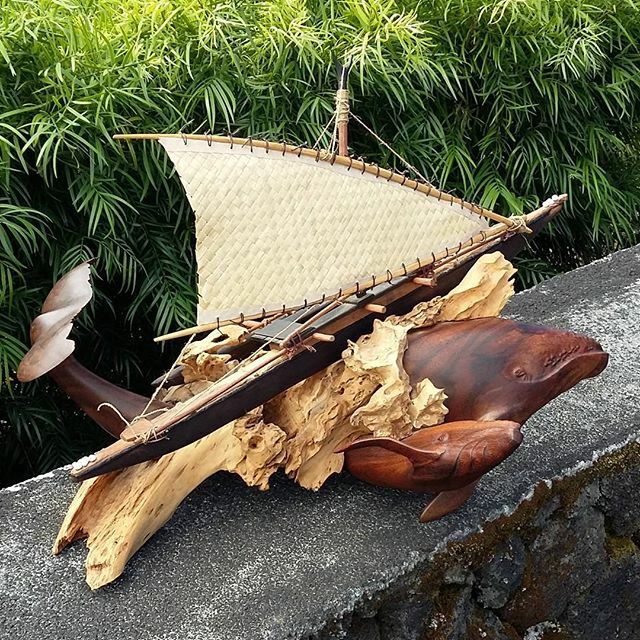 I constructed this piece out of Avocado, Ulu, Koa and Milo woods. Tool marks, a patina that will only get better with time, natural fiber lashings. Simple, functional yet elegant. The acrylic painting of an ocean swell captures the strength of the Pacific and helps tell a story of adventure and skill, navigating the open ocean in search of a productive catch. Dowsett Wa`a. 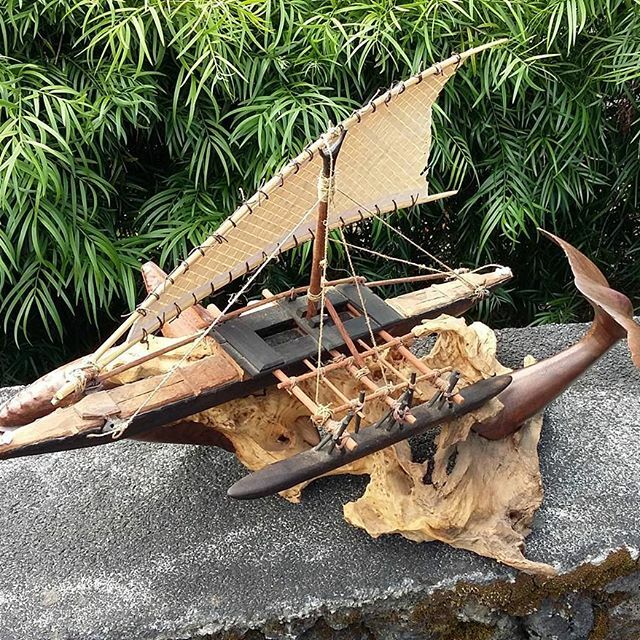 Scale model, 1/4 size. Koa. 6 feet long. Ulu Wa'a light fixture. Commissioned piece. The canoe hanging above the dining table is a light fixture! Hanging from thin, stainless steel, aircraft cable, this canoe floats effortlessly 7 feet above the floor. Two low voltage circuits power 13 led spotlights, giving this room a truly unique feel. I was commissioned to design, build and install this project. Fun! SOLD Hawaiian Fishing Canoe. Breadfruit, Koa and Camphorwood base. 18.5" long. 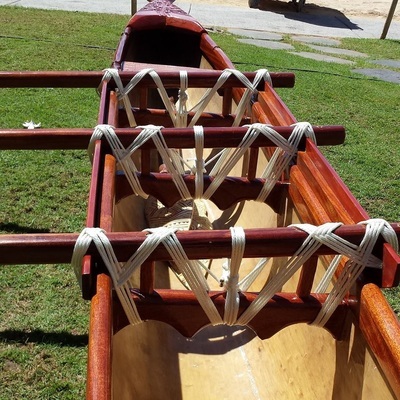 Hawaiian and South Pacific Fusion Canoe. Scale Model. SOLD. Commissioned project. 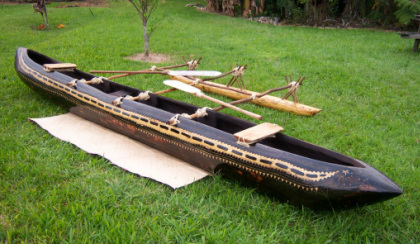 Scale model of a canoe I will build later this year. This is one of my best pieces. Still available for sale. Beautiful grain in tail! Walnut.